The search for an Argentine naval submarine that went missing with 44 crew on board is being hampered by bad weather conditions, officials say. Teams from several countries have intensified their efforts in the South Atlantic to find the ARA San Juan submarine, which vanished on Wednesday. The US Navy has sent a second ship with special tracking equipment and deep-sea rescue modules to join the search. 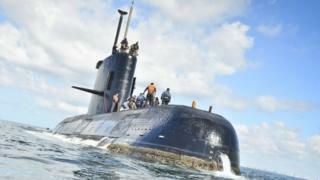 The vessel disappeared 430km (267 miles) off the Argentine coast. On Saturday, several satellite signals thought to have come from the sub were detected near the Valdez peninsula. A Nasa research plane was used in an attempt to trace the location but was unsuccessful. Rescue teams have also been hindered by heavy winds and high waves. “The weather in the area of operations continues to be very difficult,” Navy Admiral Gabriel Gonzalez said on Sunday. “Right now, we have waves of six to eight metres high with west to southwest winds of 40 knots, and unfortunately it appears that these conditions will remain for the next 48 hours,” he said. Mr Gonzalez added that the search for the vessel was further complicated by the fact that it has “very little visual area” from the surface, making it difficult to detect. The Argentine navy says the missing diesel-electric submarine has enough oxygen, food and water to last at least two weeks. READ World Cup 2018: Croatia defeats Argentina 3 goals to Nil!